Wind is caused by air flowing from high pressure to low pressure. 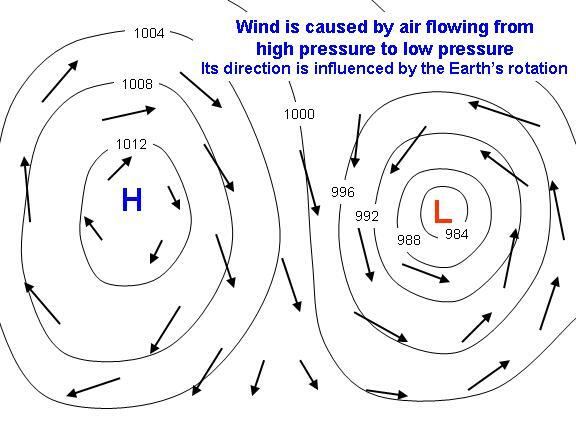 Since the Earth is rotating, however, the air does not flow directly from high to low pressure, but it is deflected to the right (in the Northern Hemisphere; to the left in the Southern Hemisphere), so that the wind flows mostly around the high and low pressure areas. This effect of the wind "feeling the Earth turn underneath it" is important for very large and long-lived pressure systems. For small, short-lived systems (such as in the cold outflow of a thunderstorm) the wind will flow directly from high pressure to low pressure. The closer the high and low pressure areas are together, the stronger the "pressure gradient", and the stronger the winds. On weather maps, lines of constant pressure are drawn (as in the example, above) which are called "isobars". These isobars are usually labeled with their pressure value in millibars (mb). The closer these lines are together, the stronger the wind. The curvature of the isobars is also important to the wind speed. Given the same pressure gradient (isobar spacing), if the isobars are curved anticyclonically (around the high pressure in the above example) the wind will be stronger. If the isobars are curved cyclonically (around the low pressure in the example above) the wind will be weaker. Wind can be thought of one way that the atmosphere moves excess heat around. Directly or indirectly, wind forms for the promary purpose of helping to transport excess heat either away from the surface of the Earth, where sunlight causes an excess of energy buildup, or from warm regions (usually the tropics) to cooler regions (usually the higher latitudes). Extratropical cyclones accomplish much of this heat transport outside of the tropics, while in the tropics the trade winds, monsoons, and hurricanes transport much of the heat. WORLD RECORD WIND SPEED The highest wind speed ever recorded on the surface of the Earth was 231 mph on April 12 1934, atop Mt. Washington, New Hampshire. This high-elevation weather station experienced the winds of an extremely strong jet stream that had descended unusually low in the atmosphere. THE WIND AFFECTS THE EARTH'S ROTATION During the northern hemisphere winter, the stronger westerly winds that build up in the Northern Hemisphere, combined with frictional drag at the Earth's surface, actually produce a very small, but measurable, increase in the speed of rotation of the Earth.